Cutaneous vasculitis encompasses a varied clinicopathologic spectrum, some of them with grave systemic consequences. A skin biopsy is often part of the first-line investigations done in the workup of such patients. A pathologist confronted with a biopsy for vasculitis has to be cognisant of the variations in morphology of these lesions with the course of the disease, overlaps in clinical and histologic features, use of ancillary tests like direct immunofluorescence (DIF), and its limitations. 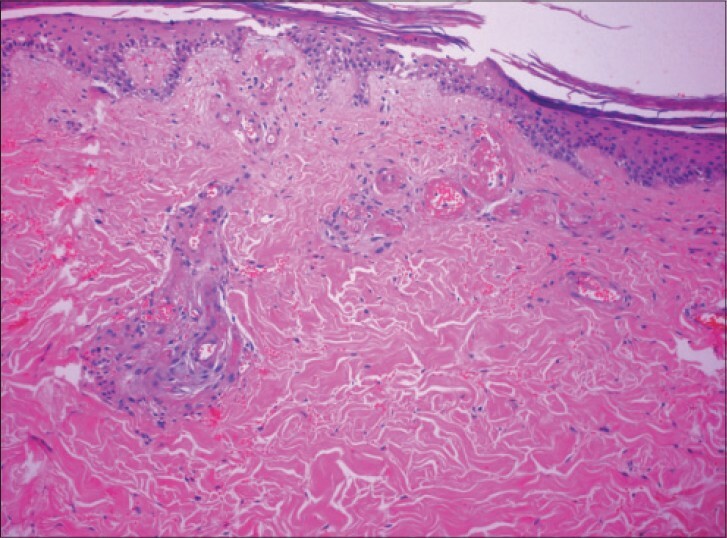 This review outlines a practical histopathologic approach to cutaneous vasculitis and emphasizes features that help in differential diagnosis. Classification of vasculitis is mainly based on the size of the involved vessel. The Chapel Hill Consensus Nomenclature (CHCC), which was revised in 2012, is the most popular one, although not the ideal one. , The classification is mainly based on the calibre of the involved vessel, i.e. small, medium, or large. The diagnosis is based on clinical criteria and not on histopathology. Clinical features vary depending on the vessel size, but there is often an overlap. Skin, being expansive and easily accessible, is often biopsied in suspected vasculitis. The role of histopathology is paramount in such instances and every effort should be made to attain precision in each case. The aim of this review is to give an outline of how a pathologist should approach a biopsy in suspected vasculitis. This does not dwell on details of individual diseases or their etiology, which are available in standard textbooks. Palpable purpura is the commonest presentation of cutaneous leucocytoclastic vasculitis (LCV). This comprises of slightly elevated reddish spots, with a predilection for pressure areas. Livedo reticularis refers to net-like areas of violaceous discoloration, generally seen in livedoid vasculopathy(LV). Livedo racemosa refers to violaceous pigmented areas with irregular or broken arc-like contours. This is often associated with systemic diseases such as anti-phospholipid antibody syndrome (APLA). , Atrophie blanche refers to the occurrence of porcelain-white scars, resulting from healing of ulcers in long-standing LV. Presence of nodules indicates medium vessel involvement. Ulceration associated with purpura is common in polyarteritis nodosa (PAN). The two most important factors that influence results are the timing and type of the sample. 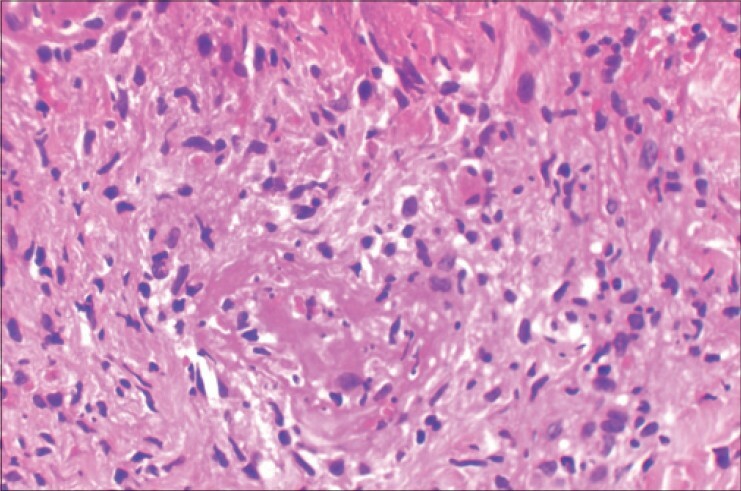 A biopsy taken too early or too late will not show the characteristic histologic features. It is important to be aware of the temporal evolution of lesions. For DIF, lesional skin is sampled. The yield is maximum when a lesion less than 48-hours old is biopsied. Those older than a week are less likely to contribute to diagnosis. Vasculitis does not simply mean inflammation of the blood vessels. The criteria used differ clinically and morphologically. In a medium or large vessel, presence of inflammatory cells within their walls suffices to be labelled as vasculitis. It is often accompanied by fibrin deposition or necrosis within the walls and thrombus formation. As stated earlier, SVV is characterized histologically by a vasocentric infiltrate in the dermis along with fibrin deposition/thrombi in their walls. Venules are mainly implicated and arterioles, rarely. The changes are often confined to the upper dermis. The most important feature that helps in identifying common types of SVV is the composition of the infiltrate. SVV with neutrophils is recognized easily, the most common examples being LCV and septic vasculitis. 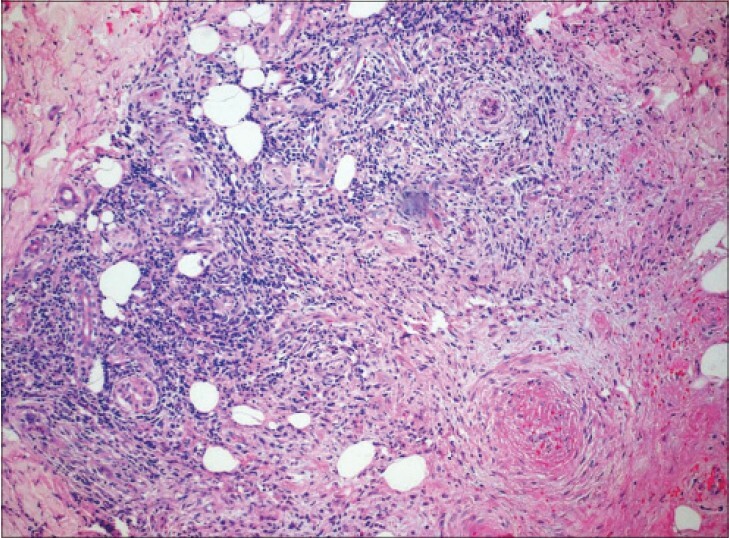 LCV is the commonest cutaneous vasculitis and derives its name from the presence of nuclear dust or debris in a perivascular fashion at all stages of its evolution [Figure 1]. ,,, Fibrin is identified in fully developed lesions and may need to be coaxed by special stains such as phosphotungsticacid hematoxylin (PTAH) or periodic acid Schiff (PAS). Extravasated red blood cells (RBCs) are seen in the dermis in varying number, contributing to the purpuric appearance. In septic vasculitis, there are thrombi occluding the lumina and neutrophils, but absent or scant nuclear dust. In LCV, eosinophils are found in varying numbers but do not alter the diagnosis. Early lesions of LCV need to be differentiated from urticaria and Sweet syndrome. In urticaria, there is a perivascular and interstitial infiltrate of neutrophils and variably eosinophils. There is no fibrin or red cell extravasation. It is necessary at this point to clarify the term "urticarial vasculitis", which implies that the lesions are clinically persistent wheals. Histologically, it shows LCV. Sweet's syndrome can be difficult to tell apart, in view of the edema and extensive neutrophilic infiltrate and absence of vascular changes. Chronic lesions of LCV may also present as erythema elevatum diutinum (EED) on the extremities and granuloma faciale in the head and neck region. ,, In addition to classic features of LCV, there is extensive fibrosis in tiers or a storiform pattern throughout the dermis. , Foamy histiocytes may also be seen. The lesion is clinically nodular and pigmented. It is important to remember that vasculitis is often associated with secondary changes that may distract one from the basic pathology. , These include marked dermal edema, infarction, necrosis of adnexal epithelium, ulceration, and subepidermal bulla formation. Conversely, one commonly encounters vasculitis in the centre of an ulcer from unrelated causes. There are several vaso-occlusive conditions, characterized histologically by thrombi within the lumen or fibrin without accompanying inflammation. Examples include disseminated intravascular coagulation (DIC), APLA syndrome, and dysgammaglobulinemia. Such cases do not fulfil the criteria for vasculitis. Embolic phenomena can also mimic vasculitis. Diagnosis of large vessel vasculitis requires that a biopsy be taken deep enough to include the subcutis. The process may involve veins (phlebitis) or arteries (arteritis). The first step in evaluation is distinguishing an artery from a vein. Veins are oblong and larger with a bigger lumen. The wall is thinner and lacks a continuous internal elastic lamina (IEL). Arteries, in contrast, are smaller, round, thick-walled, and possess a continuous IEL. Stains such as Verhoeff van Gieson aid in highlighting the elastic fibers. In contrast to SVV, the presence of a mixed inflammatory cell infiltrate within the wall of a large vessel qualifies as vasculitis. In phlebitis, this infiltrate is confined to the vessel but spills over into the adjacent fat lobule in arteritis. Both processes can be associated with thrombus formation. Three commonly seen entities under arteritis include PAN, nodular vasculitis, and temporal arteritis. Temporal arteritis is rarely seen by a dermatopathologist. PAN may be systemic or limited to skin. , Histology does not distinguish the two states. The mixed infiltrate is generally confined to the wall with minimal involvement of the adjacent panniculus. Ishibashi et al. have described the evolution of lesions of PAN. The initial acute stage shows a mixed infiltrate and an intact IEL. The subacute stage demonstrates disruption of the IEL. The reparative stage shows restitution of IEL with fibrosis of the wall. Accompanying fibrin and thrombi are also seen. It is important to remember that changes of PAN can be segmental and multiple step sections are often required to hit the lesion. In late lesions, one may see concentric fibrosis around the vessel, endarteritis obliterans, or neovascularization of the adventitia. DIF testing in LCV shows deposits of IgG and/or C3 in vessel walls. Granular IgA deposits in the vessels are indicative of Henoch-Schönlein purpura (HSP) [Figure 4]. IgM and C3 deposits may be nonspecific. It is imperative that these findings are interpreted in the context of histologic features of vasculitis being present; immune deposits alone are not diagnostic. Positive rates of DIF have been reported to vary from 39-74% in various cross-sectional studies in the Indian population. , This wide range is probably due to variations in patient selection criteria. The most important factors that affect the diagnostic yield of DIF are timing of the biopsy and presence of extracutaneous symptoms. We have demonstrated this in an earlier study. DIF was positive in 86% of cases where biopsy was done within 7 days of onset of lesions. It contributed in 90% of cases where HSP was suspected and of these 60% were positive in patients with extracutaneous manifestations. These criteria should be used to guide proper selection of patients and optimize results. It is not necessary to subject every case of LCV to DIF. ANCA-associated vasculitis was proposed as a term by the CHCC and comprised Wegener's granulomatosis (antiproteinase 3, cytoplasmic ANCA/PR3(c)-ANCA), microscopic polyarteritis, and Churg-Strauss syndrome (anti-myeloperoxidase, perinuclear ANCA/MPO (p)-ANCA). , Since then, ANCA testing has assumed great importance in the workup of patients with vasculitis. These autoantibodies bind to neutrophils, which triggers subsequent inflammation and necrosis. It is now acknowledged that ANCA may be seen in low levels in other systemic diseases and LCV limited to the skin, limiting its utility as a marker of systemic vasculitis. The Japanese Dermatological Association has approved the KAWAKAMI algorithm, which uses ANCA as a starting point for classification of vasculitis and includes seven disease entities. In addition to ANCA testing, the algorithm also uses testing for cryoglobulins, hepatitis B/C, anti-nuclear antibody (ANA), APLA, and DIF to look for IgA deposits. When a pathologist faces a biopsy done for suspected cutaneous vasculitis, the following stepwise approach will help in narrowing down the list of possibilities. What kind of vasculitis do the clinical features indicate-SVV or larger vessels? Is the biopsy appropriate for the size of the involved vessel? What is the site? What is the disease duration? (early versus late changes). If it is SVV, is the infiltrate neutrophilic or not? If neutrophilic, is there nuclear dust? Beware of secondary changes and mimics. If it is an artery, is there associated panniculitis? If yes, is the panniculitis limited to the immediate vicinity of the vessel (PAN) or extensive lobular (nodular vasculitis, other infections)? If there is extensive suppuration in association with vasculitis, always use stains to look for infections such as leprosy, fungi, and atypical Mycobacteria. This article outlines a practical hands-on approach to biopsies from suspected vasculitis. It is important to realize that histopathology may not help to pinpoint the exact cause in many cases (particularly SVV), and there are no features to distinguish localized disease from systemic. Despite these limitations, histopathology is a vital tool in the initial workup of these patients and serves as a guide to further investigations and management. 1. McKee PH. Vascular diseases in McKee′s Pathology of the skin with clinical correlations. In: Calonje E, Brenn T, Lazar A, editors. Vol. 1, 4 th ed. China: Elsevier Saunders; 2012. p. 658-710. 2. Jennette JC, Falk RJ, Bacon PA, Basu N, Cid MC, Ferrario F, et al. 2012 revised international chapel hill consensus conference nomenclature of vasculitides. Arthritis Rheum 2013;65:1-11. 3. Jennette JC, Falk RJ, Andrassy K, Bacon PA, Churg J, Gross WL, et al. Nomenclature of systemic vasculitides: Proposal of an international consensus conference. Arthritis Rheum 1994;37:187-92. 4. Carlson JA, Ng BT, Chen KR. Cutaneous vasculitis update: Diagnostic criteria, classification, epidemiology, etiology, pathogenesis, evaluation and prognosis. Am J Dermatopathol 2005;27:504-28. 5. 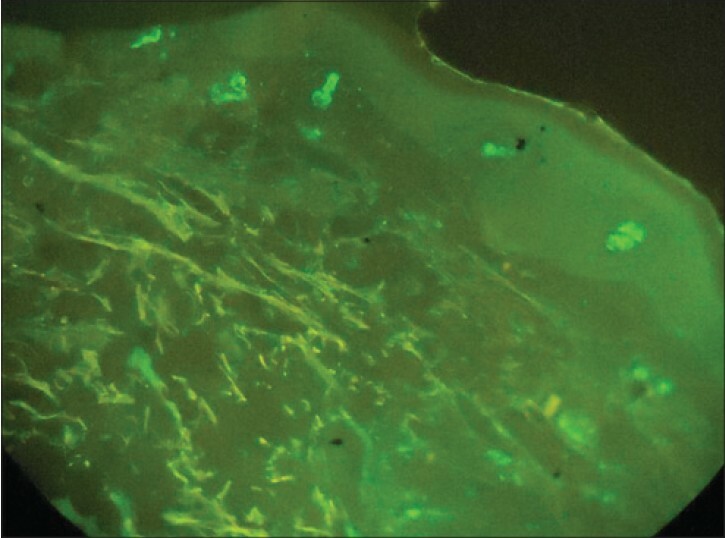 Ackerman AB, Boer A, Bennin B, Gottlieb G. Patterns of direct immunofluorescence for diagnosis of inflammatory skin diseases. In: Histologic Diagnosis of Inflammatory Skin Diseases. An Algorithmic Method Based on Pattern Analysis, 3 rd ed. New York: ArdorScribendi; 2005. p. 447-54. 6. Ackerman AB, Boer A, Bennin B, Gottlieb G. Vasculitis: Basic patterns and analysis of them in histologic diagnosis of inflammatory skin diseases. An Algorithmic Method Based on Pattern Analysis, 3 rd ed. New York: ArdorScribendi; 2005. p. 278-88. 7. Carlson JA, Chen KR. Cutaneous vasculitis update: Small vessel neutrophilic vasculitis syndromes. Am J Dermatopathol 2006;28:486-506. 8. Carlson JA, Chen KR. Cutaneous vasculitis update: Neutrophilic muscular vessel and eosinophilic, granulomatous, and lymphocytic vasculitis syndromes. Am J Dermatopathol 2007;29:32-43. 9. Ishibashi M, Chen KR. A morphological study of evolution of cutaneous polyarteritisnodosa. Am J Dermatopathol 2008;30:319-26. 10. Nandeesh B, Tirumalae R. Direct immunofluorescence in cutaneous vasculitis: Experience from a referral hospital in India. Indian J Dermatol 2013;58:22-5. 11. Gupta S, Handa S, Kanwar AJ, Radotra BD, Minz RW. Cutaneous vasculitides: Clinico-pathological correlation. Indian J Dermatol Venereol Leprol 2009;75:356-62. 12. Kawakami T. New algorithm (KAWAKAMI algorithm) to diagnose primary cutaneous vasculitis. J Dermatol 2010;37:113-24.